We got our first overview of the new Forge of Azeroth system coming to World of Warcraft in patch 8.2 during the livestream yesterday. But Sloot got a more in-depth look at the first set of Essences available to power up our necklaces. This is still the first look at content that isn’t on the PTR, so keep in mind that any numbers you see could be placeholder and subject to change. There are some promising looking abilities showing up — including a few that look suspiciously like our favorite trinkets from raids past. This is just an example for a Protection Paladin, the spell with the cooldown being lowered would vary based on class. The full list of 21 Essences is worth perusing if you’re interested in starting to plan out your dream team of powers. There are already a few standouts that have me wondering what sort of fights we’re going to be looking at in Rise of Azshara. The Artifice of Time is the big standout healing Essence, a large external cooldown that allows damage to be staggered over time like Brewmaster Monks can. This could lead to some very interesting situations where you can brute force tank swap mechanics in raids, or have a single target take a big hit meant to be split between a few people. It’s going to be interesting to see if the staggered damage is able to be mitigated after the fact as well. Think how strong it would be to have a Paladin use Divine Shield to clear out all the staggered damage. Life Binder’s Invocation: 3 Minute Cooldown. Major Power Give 40 Seeds of Eonar divided among all allies within 30 yards. The Seeds do a small heal over time, but if you’re attacked burst, and heal for more. Minor Power Heals have a chance to give a Seed of Eonar to your target. The Unbound Force: 1 Minute Cooldown. 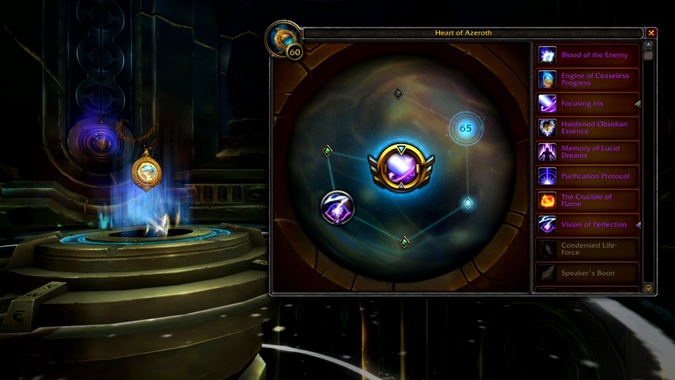 Major Power Unleashes the power of the Heart of Azeroth, making shards of Azerite hit your target ten times. Critical hits deal 300% damage. Minor Power Every critical hit gives you a stack of Reckless Force. Once every ten seconds, you’ll launch a shard of Azerite with your next attack dealing extra fire damage. Null Dynamo: 2.3 Minute Cooldown. Major Power Create a powerful shield that absorbs a large amount of magic damage and cleanses all Magic, Curse, Disease, and Poisons from you. Minor Power. Every 15 seconds get a small shield. If the shield is broken it deals shadow damage divided among all nearby targets. Damage Essences have everything from Azerite spikes erupting from the ground, Guardians of Azeroth coming to your aid, and a helping hand from MOTHER. Using the Purification Protocol you’ll be able to call down a giant laser blast to smite your foes. Similar to the Reorigination Blast from Uldir, this laser will be able to stun Aberrations and outright kill weaker creatures. I don’t know how many Aberrations we’re going to be running into in Azshara’s Eternal Palace, but I know it’ll be hard to choose another power than this. Since I primarily spend my time in Guardian spec I’ve got my first Major and Minor powers already selected. I’ve been using Bwonsamdi’s Bargain for the last little while, so I’ve really grown accustomed to having that “get out of jail free” moment of not dying — luckily the Essence of Infinity provides that with extra benefits! There’s some tough competition for the minor slots, Vision of Perfection would lower the cooldown of one of my defensive abilities, but The Engine of Ceaseless Progress has a lot of fun secondary stats. It’s good that switching between these is going to be so easy — I wouldn’t want to be summoned back between every pull while I tinker with things. The more I see of the Essences, the more I like the system. Knowing where each of the ranks of them come from, and being able to target reputations, raids, or PVP specifically to get what I need will make getting the perfect set up easy. Plus these look like fun abilities!